L-R: Belinda Chapple, Tiffany Wood, Sally Polihronas, Sophie Monk and Katie Underwood made up Bardot. BIRTHED from the debut Australian season of Popstars, girl group Bardot were a pop act who burned brightly - and then, just as quickly, flickered out. While they were infinitely more successful than the Popstars-spawned acts that followed (sorry, Scandal'Us), the story of the five-piece - Katie Underwood (Cyborg Ginger Spice), Sophie Monk (Marilyn Monroe Impersonator Spice), Tiffani Wood (Cowboy Hat Spice), Belinda Chapple (Posh Spice With Vocals) and Sally Polihronas (Good At Doing the Cool Talky Middle 8s in Songs Spice) - nevertheless felt like a tale of unfulfilled potential. Back where it all began, clockwise from top right: Sophie Monk, Belinda Chapple, Sally Polihronas, Katie Underwood, Tiffany Wood. Underwood jumped ship just 12 months after the release of their debut single, Poison. A year after that - riding high with an unbroken string of six top 20 hits to their name - the group parted ways with the most early noughties send-off imaginable, a farewell concert broadcast live on Channel V (and hosted by James Mathison and Andrew G, who both tuxed-up out of respect for the momentous occasion). Bardot’s final-ever performance, I’m not crying you’re crying. That they managed the success they did seems like a miracle - in contrast to today's slickly polished TV talent shows, the first season of Popstars was an enterprise so lo-fi that celebrity judge Jackie O was seen fronting up to auditions with her handbag and a bag of shopping. And yet, everything seemed to fall in a heap just as Bardot were really getting going. Now a meditation teacher and mum of two, Underwood, 42, is no longer in the public eye - but she'll make a rare musical appearance next Friday night at Melbourne noughties club night Popchops, performing a handful of hits including Poison. It'll be "about the third time in 18 years" she's sung it, and also a rare opportunity for fans to hear the song, given that none of Bardot's music is available to stream on Spotify or Apple Music (shame, shame, shame). We spoke to Underwood about her brief and turbulent stint in the chart-topping girl group, why Bardot really went their separate ways - and why they're never, ever getting back together without, like, a sackload of cash. Let's get that Kickstarter going, guys. You went from an unknown hopeful auditioning for a girl group to performing for thousands of hysterical fans within a matter of months. It must have been surreal. Totally. It was totally different from a band who'd spent maybe a year, five years, 10 years to achieve that sort of fame. We were given it on a platter, seemingly overnight. It was really weird, and it took me a long time to get my head around it. I had that 'impostor syndrome', where you have success but you don't' feel like you've earned it. Certainly in the early months of our fame, I felt it didn't match [our accomplishments]. Over time, I felt we started to deserve some of the accolades we got - but in those early days, it was weird. Bardot were whisked on a whistlestop tour of Australia’s suburban shopping centres, as was the style at the time. There's still a lot of affection for the group among pop fans. I remember those first few albums I ever bought - for me it was Wham's The Final Album and INXS' Kick. I think Bardot for a lot of people, because we targeted that 10-18 age group - that generation who are now in their late 20s and early 30s still have fond memories of us. And of course it wasn't just about the music, it was about the hype, the overwhelming reality TV hype that was all around us. You left the group within 12 months of Poison's release. It seemed an abrupt departure. What happened? It was a strange sequence of events, even for me. We were in the UK, recording the second album. The music was much better, we were working with international producers, and everything looked like it was on track for us to have a great second album. We had a new manager, who suggested that I should audition for a musical. I remember it quite distinctly: We were in a mini-van, travelling around the UK, and all the other girls were in the van. It was such a weird thing, him saying in front of everyone "I think you should go audition for this musical." I said, "What time do you think I have to do a musical? I'm in the band." He said, "Oh, no, well, just for the experience, I think you should [audition]." So on his suggestion, I auditioned for the musical - it was Hair, Harry M. Miller's production. It went well, but when I asked our manager about it a few weeks later, he brushed it off and said we didn't hear from them. Then there was a call from Harry M. Miller's office a few weeks after that saying, "Hey, we didn't hear from you - did you get the scripts?" I had no idea what they were talking about but I'd gotten the part. My manager hadn't told me! It started this avalanche of decision making: How can I turn this down? Yeah, I'm in this great band, but we're still not earning any money, and now I've got someone who wants to take me on a national musical and pay me $2000 per show. I surveyed the girls, and half of them thought it was a great opportunity and half of them thought it was a betrayal to consider leaving. That was fine; I had to hear all that out. But I decided to leave, and take a chance. 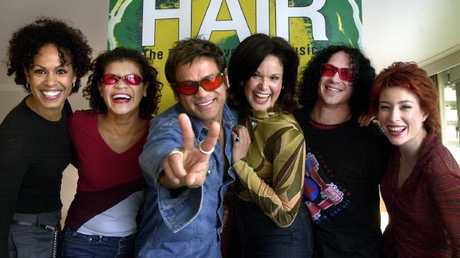 Underwood (far right) at the cast announcement for Hair in 2001. The production was cancelled before it opened. That manager's insistence you audition for a musical sounds so different to the stories we usually hear about pop groups - people like Geri Halliwell and Zayn Malik going solo because they weren't able to pursue interests outside their bands. Look, several of us had a few conspiracy theories when we got together for the 10-year anniversary, thinking that maybe this new manager was trying to subvert the group and break us up, and bring Sophie off to be a solo artist, which kind of happened about 12 months later [Monk released a solo album, Calendar Girl, 11 months after the group disbanded]. We speculated that this manager had an ulterior motive from the very beginning, which was that he was only really interested in one band member and wanted to break the others off. But that's all speculation, and I don't want to get in any defamation suits, so we should stop there [laughs]. Where were you when Tiffani Wood invented country music? After you left, Bardot managed the seemingly impossible for a Popstars act, releasing a well-received, successful second album. Then just like that, they split. I remember going to see them in concert the year after I left, and they broke the news to me: "We haven't announced it yet, but we're breaking up." I said, "What are you talking about? You girls are finally doing music that's really great. Even I like it!" I Need Somebodyhad the disco flavour; I thought their sound was evolving. I would've loved to have been on that track. But they were like, "The damage is done." They filled me in on some of the internal politics and … it was just too little, too late. It was one of the first things our first manager warned us about. He said, "You girls will be under a lot of pressure, but the only thing that'll really break you up is if your relationship with each other breaks down. Then nothing will save you." In the end, that's what happened - there was just too much bad blood between the remaining members and it couldn't be recovered. After Katie’s departure, Bardot forged ahead as a four-piece — but suffered bitter in-fighting about who got first dibs on off-the-shoulder tops. But you'd managed to repair your own friendship with the girls after your exit? I think all was forgiven afterwards. But I think my leaving, and the opinions the remaining members had about that, caused some of the division within the group. It started fundamental disagreements with each other which were then perhaps never resolved. The musical that you'd left the group to star in was cancelled - that must have been rough. When the Hair musical fell apart and I'd left the group, I didn't really know what I was going to do. I guess I was saved in a way by Dennis and Darren Dowlut - Disco Montego - who approached me to be a part of their new outfit. I have a lot to thank them for. Beautiful became, to this day, my biggest hit. And to be involved in the songwriting - we didn't get that opportunity in Bardot, all the songs were kind of prepared for us. You live a more private life now as a meditation teacher, but you were back in the news last year after having quite a visceral reaction when invited to audition for The Voice. It was actually the third year running they'd invited me to do it. The previous year I'd humoured them, and decided to give it a go and got to a point where they were ready to send me to Sydney to the blind auditions. They sent through the contract. And, very quickly, I was reminded of all the reasons I was happy to leave all the Popstars and the Bardot contracts behind 20 years ago, and that really nothing much had changed. I said to them: Look, this is the sort of contract that an 18-year-old with nothing to lose is going to sign, but there are so many things here that I'd need to change to make this OK for me, so thanks but no thanks. So the reason I had such an extreme reaction when they invited me to audition again the following year … I thought, surely you must have my information on file! Surely you must have the numerous emails from me about how ridiculous the contract is and how I'll never sign it. It was interesting, when I posted that on Facebook, how many other entertainers from around Australia stepped up to say they've been asked too, multiple times. It seems par for the course that The Voice does this run of trying to 'dig up' existing talent. OK, let's get real. The Spice Girls, All Saints and Bananarama have all done it. What's it going to take to get a Bardot reunion happening? What would it take? A hell of a lot of money. The girls and I did get together at the 10-year mark, and it was Sally, because she's got the best business and marketing acumen, who put together a proposal for us all to look at about how viable it was for us to reunite. We considered it, but I know for a fact that Sophie was never interested in reuniting. Perhaps that was because of the way the band broke up. Now, the rest of us are far apart: Belinda's living in Europe, Sally's just had a baby, Tiffani's got five children, I've got two kids. We just have far too much going on, that even if we did want to, it would just be too difficult to co-ordinate. The closest we're going to get is me singing Poison in a club in Melbourne. It's the one-woman Bardot reunion - it's a little bit sad, but it's the best I can do. It's an hors d'oeuvre, a Bardette. I'll do my best for the team! Katie Underwood performs hits including Poison, Beautiful and Magic at Popchops in Melbourne on Friday February 23.